You Have No Legs is a 2D platformer made in Flash in one month for the SA Gamedev Challenge. The theme for this competition was "You can't...", meaning that the game had to revolve around some obvious lack of ability. I started with the idea of a platformer where the player character is unable to walk; after some brainstorming, I thought of making a game with a disabled main character. The intersection of those ideas led to this. The main character is a legless amputee who moves by crawling and climbing. This is done by moving the character's arms with the mouse, clicking and dragging to move. You Have No Legs draws inspiration from the "Metroidvania" archetype. The game revolves around exploring the world, collecting powerups and finding secrets. 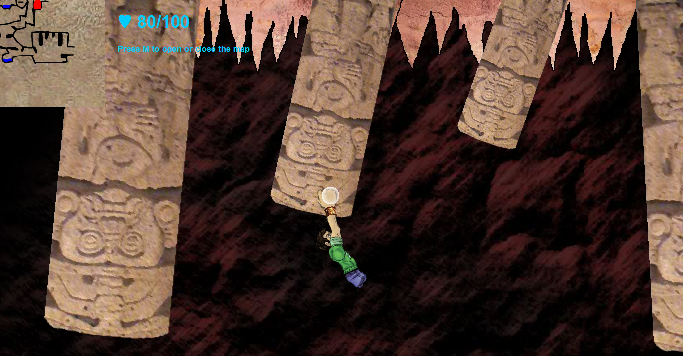 Most powerups grant the player new abilities which then allow him to explore new parts of the world. The game world is non-linear and has a number of hidden rooms that house optional powerups. I designed the game in its entirety and programmed it in ActionScript 3, using Box2D for physics. Designing and building the game's levels took a significant portion of the month. To make it easier to design levels, I developped a system that took a Flash MovieClip and turned it into solid Box2D objects. This way, creating a level was simply a matter of positioning boxes and images within a MovieClip in Flash and give them properties such as "Dynamic" or "Breakable". The game map used a similar system. You Have No Legs won first place in the competition. It was noted as being highly innovative and making very good use of the theme.